Description: Not too long after CSX figured out that road slugs feeding off excess power was the greatest thing since sliced bread. S End of Winston Yard. Description: A pair of slug sets in charge of train O800 at SE Plant City on the S-line. 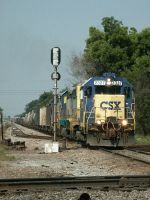 CSXT 2327 was originally L&N 1109, a non-dynamic brake-equipped GP35. Date of photo approximate. Description: Q29128 has 91 cars. Description: CSX Road Slug 2327 leads J765 (Louisville Ky. to Bowling Green Ky.) through Glendale. CSX 6919 is trailing. Description: A mother and slug switch a cut of cars for the outbound Q199. A beautiful St. Patricks Day morning and a photo posted in memory of my late father whose birthday was this day also. Description: Eastbound local with a GP35 road slug on the point.